Art Therapy is one of the most flexible therapies in terms of establishing a plan for treatment. It is difficult to call an art therapy session “typical” given the various art activities that can be utilised in a session. However, therapists do have schedules to adhere to and an overall goal of helping their client. For art therapy that is delivered in structured environments such as schools, prisons and hospitals, there is an emphasis on outcomes. Often there is also a direct request for proof that an art therapy program is working. This is especially relevant when dealing with funding constraints. Furthermore, some structure is helpful to ensure that the therapist and client remained focused on issues that the client wishes to resolve. Art Therapists generally have a preferred orientation of psychology theory that provides a reference point on how a treatment plan is constructed, or in some cases, not constructed. Treatment planning encourages a focused approach for both the client and therapist to resolve current issues for the client. 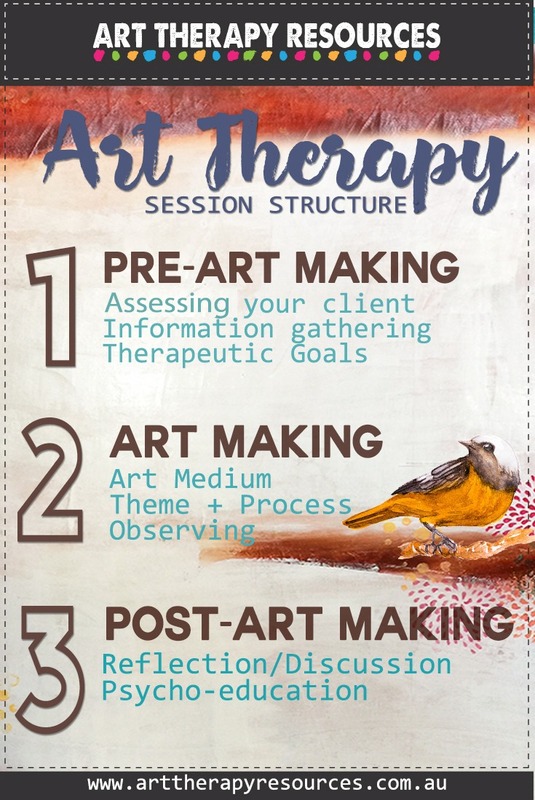 In general, there are 3 important stages of an art therapy session which loosely define an effective art therapy session. These 3 stages are outlined below. As always, an Art Therapist will utilise clinical skills and personal understanding of their client to create an individualised session. The first stage of the art therapy session entails assessing your client. If your client is visiting for the first time, this will involve a detailed process of collecting information about your client, and the precipitating factors that led them to making an appointment with you. Your client may have initially made direct contact with you, or received a referral from another healthcare professional. In addition to gathering information from your client, you may take this opportunity to provide some education about the concept of Art Therapy to your client. This is an opportunity to outline the benefits of art therapy, the typical process of an art therapy session, and address any reluctance your client may have in participating in art activities or therapy in general. If your client is a returning client, then the initial stage before art-making will involve a brief discussion on how your client is currently feeling. Your client may also briefly discuss any issues that have occurred since their last visit. Therapeutic goals should be set in the first session and on a smaller scale for subsequent sessions. These goals are discussed and agreed with by your client to ensure your client is engaged in their own treatment plans. This also helps your client feel that they have a purpose and sense of control over improving their circumstances, which they will need to do outside of the safety of therapy. A large number of goals typically focus on self, family, and external environments, such as school, work, and social networks. The first stage can also include art making. If you decide that your client may benefit from multiple art activities in a session, then the beginning stage of discussing goals may also include an art making activity. Art medium – whether your client will create a 2D item involving drawing or painting, or whether it will involve a 3D medium such as sculpture. Process – the process could be directive or non-directive. If your client is cognitively impaired in some way, you may want to reduce confusion and give more directive suggestions. For all 3 elements listed, it is imperative to keep individual differences in mind to account for your client’s abilities, and also to encourage your clients participation. Initially, you introduce the art exercise you have in mind, along with a suggestion of the materials to use. This may involve a different process depending on whether your activity is based on a diagnostic or therapeutic goal. It is important to always be open to feedback and remain flexible in the art making process. The fundamental principle to keep in mind is the decision-making process and freedom of choice for your client. Offering your client choices of the art activity and art materials will help foster an environment of self-expression with a sense of control. Once the exercise and materials have been agreed upon, the process of art making can evolve. While your client is making art, your role is primarily to observe. Some therapists may want to take notes, however, the art therapists activities should not impinge on the freedom of your client when they are making art. If your client has any questions or comments while making art, your expertise can help guide them through any difficult steps. However, always keep in mind your communication should be non-directive while your client is making art. You may find a new client is unsure of the art making process and therefore many of the questions you may need to address will be about using specific art supplies. You may also need to address the issue of perfectionism with clients who make statements such as, “I can’t draw”, or “I’m hopeless with art”. Remind your client that they are not creating an artwork to be judged and interpreted, but instead, the benefits lie in the process of art making. An added bonus of an art making session is that the creative process will arouse your client’s connection to the joy of art. This connection may bring emotions to the surface for your client which include a sense of joy and accomplishment of completing the task. Because art making is an activity that requires physical movement and cognitive effort, you should assess any physical restrictions or cognitive impairments which may influence the art activity that you suggest. Clients should not be asked to undertake a task that will increase any physical pain or cognitively frustrate them. Furthermore, you should be able to assess your client’s social development, particularly with regard to conducting group art therapy. The observation process often results in periods of silence while your client creates. It is important for the client to understand that as a therapist would not interrupt someone talking, this translates to the art making process, whereby the activity itself is also viewed as the client “talking” in a non-verbal manner. Your client may have questions and comments to make throughout the art making process, and in this instance, you can respond to questions directly where required, but generally keep any discussion open-ended. All of the above observations are made in terms of extreme points of view where behaviour may be described in a black/white context. Eg, whether your client is flexible vs rigid. A client’s reaction and attitude occurs on a continuum where feelings and thoughts are more complex and nuanced as opposed to black/white. It is important to note, that if a behaviour is observed, you can test your hypothesis through other therapeutic methods. For eg, if the client exhibits behaviour during the art making process that seems obsessive, this can be further screened through more formal OCD tests. Throughout the entire art making process, it is important for the art therapist to understand they are observing through their own personal expectations. If you are a very organised artist with your supplies, it is not useful to classify your client as disorganised if they don’t use supplies the same way that you would. For example, an art therapist may know the exact amount of paint to squeeze out of a bottle to cover an A4 sheet. Conversely, for a client who hasn’t used paint before, they may squeeze out the entire contents of a tube hoping they have enough. An art therapist who incorrectly applies their own bias to this situation may run the risk of over analyzing their client’s behaviour. Once the art activity is completed, a discussion can begin with your client. You can use some of the observations made to explore your client’s feelings and thoughts around the art activity. You can ask your client if they want to give their artwork a title. This will begin a verbal discussion of how your client feels about their creation and can provide a way for your client to summarise their thoughts and feelings down to a main theme or issue to further explore. If your client isn’t able to title the artwork, they may instead benefit from writing down various words of association they have about the artwork. This may also prompt further journal writing by your client. What they thought of while doing the art? What they thought of the materials they used? If any overwhelming feelings surfaced during the creative process? Did they notice a change of mood from the beginning of the activity through to the end? Did any frustrating or angry feelings surface, either about the art activity or about the result? Have any new ideas come to mind about their current situation? Did the artwork stir any memories? It helps to ask open-ended questions, however, you may have observed something in the art making process which you want to explore with your client and this may require a direct line of questioning. It is important to avoid giving interpretations (avoiding your bias) and reaffirm with your client that you are not looking for hidden meanings within the art. This time of the session is also a good time to provide any psycho-education that you feel is relevant to the topics that have been discussed. Once the session has ended you will want to address how the artwork will be stored. It is best to keep the artwork at your premises while the client is receiving treatment. This enables you to refer to it in the future. Paper based art can be hung on a corkboard or stored in the client’s file if it is small. Items that are 3D in nature can be stored on shelves or other furniture. For art activities that are temporary, such as sandplay, you can take a digital photograph and store the photo in the client’s file. A therapy session structure enables you to work productively in your therapy practice and provide a framework for your client. Assess your client’s current status and any potential issues they would like to address. Educate your client on the art therapy process. Suggest possible art activities taking into account art supplies and themes that connect with your client. Let your client create freely and only observe, not interject. Be mindful of your own bias towards observing your clients behaviours. Discuss the art making activity with your client and ask for their feedback on emotions and thoughts that surfaced throughout the activity. Individual differences should always be considered. 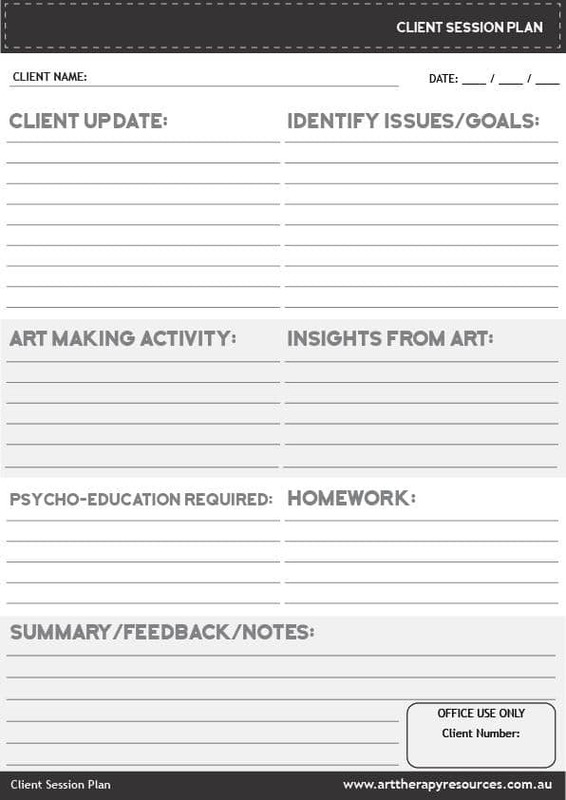 Included below is a FREE Client Session Plan template. This template can be printed multiple times for each session.